Lawn Fawnatics Challenge #24-Fun with Dies! Hello! I wanted to play along with the current Lawn Fawnatics Challenge #24-Fun with Dies! I decided to make my first every pivot pop up card:) So fun!!! For the front of my card, I used the Hay There Stamp Set and Lawn Cuts along with the Leafy Tree Backdrop: Portrait Lawn Cuts. I also used the Stitched Hillside Borders and some Perfectly Plaid-Spring dp for the hills. I framed the scene using a Stitched Rectangle Frames Lawn Cut. For the inside, I used the Twist Pop Up file from Silhouette for the pop up portion and I decorated it using more images from Hay There along with the Stitched Hillside Borders once again and some dies from the Scalloped Treat Box Spring House Add On Lawn Cuts. I just love how this came out and can't wait to try more twist/pivot pop up cards! Thanks for stopping by! Oh goodness, I love this charming card! Such awesome use of all the dies. 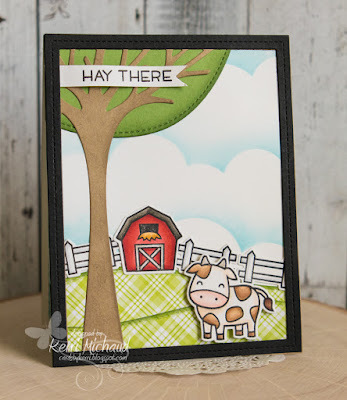 I especially love the Leafy Tree with the adorable Hay There scene with plaid rolling hills! The inside is amazing with cute critters and beautiful clouds! I'm so happy you joined our Fun with Dies challenge at Lawn Fawnatics!